Carlos Queiroz says he could not continue as Iran manager because of the lack of support from the country's football federation (FFIRI). The Portuguese, 62, who assisted Alex Ferguson at Manchester United for five years, took Iran to the 2014 World Cup. There has been no official confirmation of Queiroz's departure, but he spoke of his intention to quit after his side's friendly defeat by Sweden on 31 March. Queiroz previously managed Real Madrid and the Portuguese national team before joining the Iran set-up in 2011. He led the nation to last summer's World Cup but said he planned to quit after the tournament because of a lack of government financial backing. After finishing bottom of Group F, Queiroz decided to stay on and managed the side in this year's Asian Cup, where they reached the quarter-finals. But now his future is once again up in the air, even though federation president Ali Kafashian appeared on national television saying he wanted to keep him on as manager. Speaking of a meeting he held with the federation, Queiroz insisted: "The president agreed there was no other option but to go our separate ways. "But for a peaceful agreement, I don't mind becoming the bad boy because the fans know the truth." 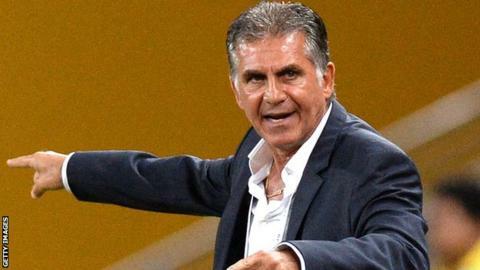 Listen to Carlos Queiroz's interview and more from World Football on BBC World Service via this link.